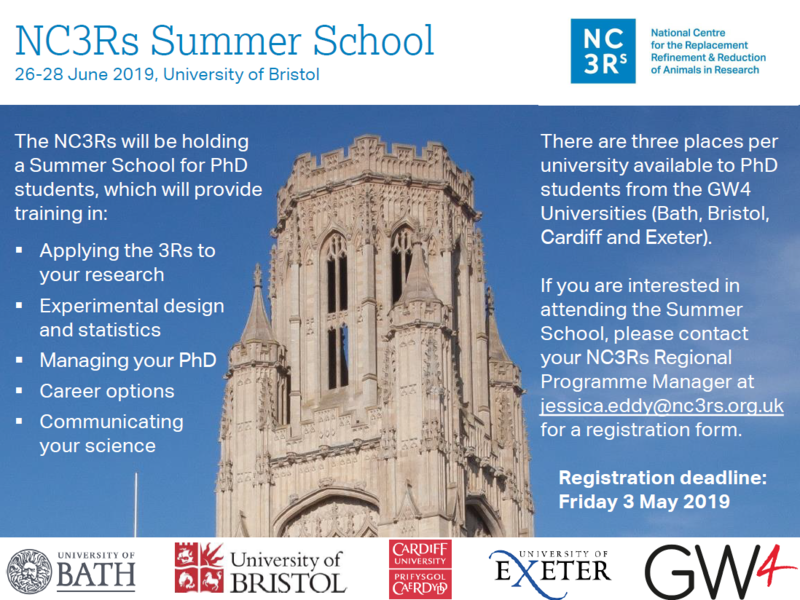 The NC3Rs (National Centre for the Replacement, Refinement and Reduction of Animals in Research) will this year be holding its annual PhD Summer School on 26-28 June 2019 at the University of Bristol. This event is open not only to NC3Rs funded PhD students but there are three additional places per university available to PhD students from the GW4 Universities (Bath, Bristol, Cardiff and Exeter). The three day event is free to attend with all meals provided and two nights complimentary bed and breakfast also available where required. The Summer School is presented in a relaxed environment allowing attendees to network between themselves and also with the speakers and scientists from the NC3Rs. During the event there will be interactive sessions as to how to apply the 3Rs to your research and talks will be given about experimental design and statistics, how to manage a PhD, communicating your science and careers advice (view draft agenda). The event is designed to provide you with opportunities to improve your skills set and expand your career prospects by establishing connections (Summer School 2018). This event is of particular relevance to students either working with animals or with technologies that directly replace the use of animals in research. If successful, you will receive confirmation by Wednesday 15 May.